Here are some of my dark red inks, shown in pens and not in toothpick samples. 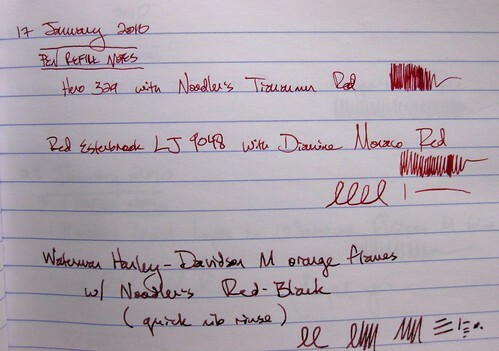 We have Noodler's Tiananmen, Diamine Monaco Red, Noodler's Red-Black, and Noodler's Swishmix Burgundy. This is probably a fairly accurate representation of the colors, though most of the nibs were very much on the fine side. As for the Noodler's Swishmix Burgundy at the bottom, I have to admit I do not much care for it. I find it chalky, and that really bugs me in an ink in ways I can't even explain. If you have a Flickr account, you might like to see a larger version of this photo, where you can see the subtleties of the inks. Next we have a cropped version of the top three inks, which I do like. This was not a conscientious red ink comparison, I just happened to refill a bunch of dark reds at once. I have a love-hate relationship with the Noodler's Red-Black, which is usually too brown-looking for me. On some papers, usually coated postcards, you can really see the red undertones of the ink, but on most papers it ends up looking sorta brown like this. The upside is that it's partly waterproof - the black component is waterproof, so the red may wash away but the black will stay. The Tiananmen and the Diamine Monaco Red have very special places in my heart. It doesn't hurt that the Monaco Red is in one of my very favorite pens - a red Esterbrook LJ with a semi-flexible 9048 nib. It's a joy to use, and the shading (color/saturation variation) in the Monaco Red is lovely. Are you getting sick of the ink stuff? I am, a little bit. I have more ink photos in the queue, but I believe for my next post I'll jump ahead in said photo queue and post about a letter. It's good to have a *mix* of ink and letter posts. I think I like the top two the best. The Monaco Red looks the closest to my idea of a great bright red, personally. Love it. 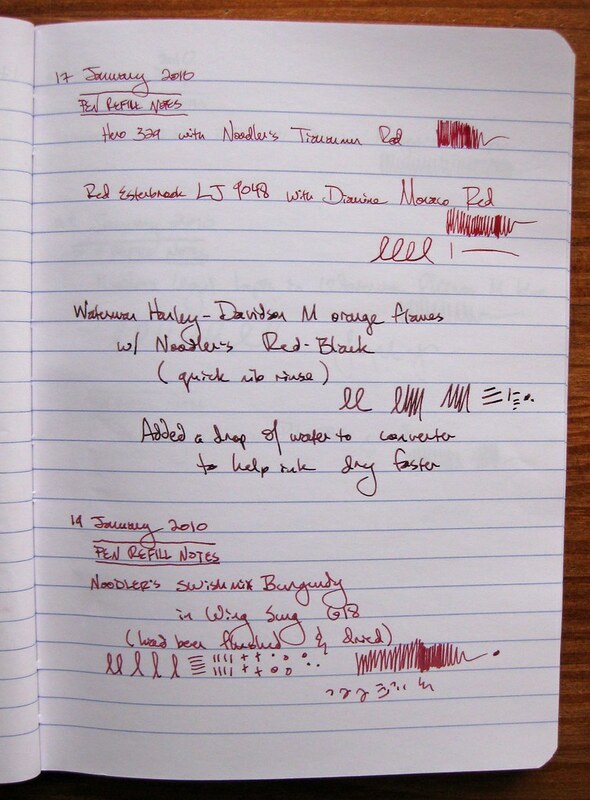 The Noodler's Red-Black looks like a color I accidentally mixed up, that I call "Scab" A dried blood red-brown color, made from a bright red and a dark olive green. Not the color I was aiming for! I like your ink posts! I have bought some new colors to be used with the nib pen, but haven't yet managed to buy a fountain pen which doesn't use cartridges. We spent Easter in Hamburg, Germany, and I found a shop selling fountain pens, but the cheapest ones still cost about 70 euros and I would like to start with even cheaper one. Or what do you say, what would be a normal price for a normal fountain pen to start with? Was this cheap and I just didn't understand? Sirpa - it depends on the brand of the pen for cost. I honestly have no idea what import/export duties are in Finland, and they can sometimes make pricing very different from country to country. I know here in the USA, I always find the cheapest prices online instead of in actual stores, but we have a lot of online pen sellers in the USA. Not sure what your market is like in Finland. I saw a mention of an on-line fountain pen group in Finland called Stylophiles of Finland. The forum was in Finnish, so I don't know what the discussion subjects were, but they should know all about where to shop, locally! Try a Google search for the web-site. There are many inexpensive fountain pens that come with converters to use bottled ink. Just don't try to use art ink or drawing ink or calligraphy in a fountain pen - BIG NO-NO!